When the average person hears eating raw food a myriad of thoughts and questions go through their mind. Does that mean eating only raw food? Who could do that? Who would want to do that? Can you survive by only eating raw foods? As a long term raw fooder, I’ve heard just about all the comments and questions by now and it never fails to bring a smile to my face. After a brief explanation most people find it makes sense even if the idea does bump rather solidly up against their beliefs around food and diet. For many people eating raw food is a completely new concept, but people have been doing it for years. As a matter of fact, humans have been eating raw foods since the beginning of time. And today it’s quite popular with a growing number of people, including movie stars like Demi Moore and Woody Harrelson, and super model Carol Alt, who are following a raw food diet. Many cities across the country have a raw food restaurant now, or at least a restaurant that serves a raw dish or two. You only have to check the shelves at your local bookstore to see the many books touting the diet and offering tasty recipes to their readers. Let’s take a closer look at eating raw food and see what the excitement is all about. •	The first thing that’s really important to know is that eating raw isn’t an all or nothing proposition. Many people eat around 70% to 80% raw food and are still considered to be following a raw food diet. Being 100% raw takes dedication, perseverance, and perhaps a little luck in finding the right raw diet and a mentor to help you through the tricky parts. 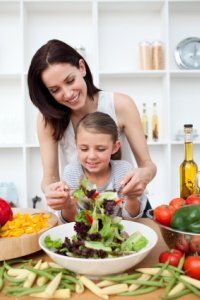 •	Many people are drawn to the raw diet with the hopes of finally getting some relief from health conditions that haven’t been helped by other diets or healing modalities. The opportunity to feel good and have energy on a daily basis is huge for these people. Some people want to lose weight and keep it off permanently, while others just want to take their health to the next level. •	There are a number of raw fooders who have been following a raw food diet for 20, 30, and even 40 years, and they are not only surviving, but thriving on the diet. Most people who have been successful with the diet will probably tell you it’s not a diet at all, but a lifestyle change. You can get an idea of why people get so excited about eating raw food by reading these success stories. •	And yes, there are those who are unsuccessful with the diet. Generally because they don't eat a balanced diet, eat too many raw food treats and junk food, or succumb to social pressure. This brings us to a very important point; no matter what diet you follow, if you leave out the junk and eat healthy foods you can enjoy relatively good health. The key of course is knowing what constitutes junk food and which foods really are healthy foods. •	A healthy raw food diet is based on fresh fruits and vegetables accompanied by nuts, seeds and sea vegetables. Freshness is key, with minimal processing, not over eating, and allowing each meal to fully digest before eating again. Finding which combination of raw foods will work best for you can be a little challenging at times, but the results are totally worth the effort. Doing a little homework first will make for smoother sailing in the long run. If you still have questions about eating raw foods then let’s get them answered here. Although many times a raw meal may be comprised of a simple salad there are plenty of tasty recipes that will leave you longing for more. Taking some of your favorite recipes and using your imagination can yield some tasty raw recipes that will make you forget all about cooked food. If you need some ideas take a look at these yummy raw food recipes. Hopefully we’ve shed a little light on eating raw food and motivated you to give it a try. Remember just adding more raw foods to your diet will create a healthier diet overall, you don’t have to jump in with both feet; all you need do is ease in at a comfortable pace. The important thing is getting started.